Peterborough Sports' matchwinner Mark Jones (blue) tussles with Johnny Clay of Deeping Rangers. Photo: David Lowndes. The Hinchingbrooke Cup was won last night (May 2) by a goal worthy of a much grander occasion. Mark Jones of Peterborough Sports was the scorer with a stunning 20 yard volley from a driven Dan Lawlor corner eight minutes from time to give his side a 2-1 victory over Deeping Rangers at Yaxley Fc’s In2itive Park. Josh Moreman of Peterborough Sports (blue) on the burst in the Hinchingbrooke Cup Final against Deeping Rangers. Photo: David Lowndes. 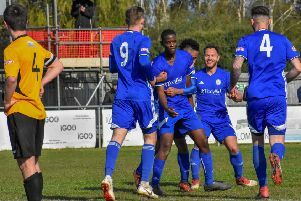 The match looked set to go to penalties after a low-key second period until Jones, a former Deeping player, delivered a moment of sublime quality to settle a battle between the two best two teams in the United Counties Premier Division. And for most it Sports proved why they finished 18 points clear of their closest rivals. There was a remarkable start with Sports scoring after 33 seconds when Jordan MacLeod’s cross flew into the net. A swirling wind made life difficult for both goalkeepers and Sports number one Lewis Moat was culpable when Deeping equalised after just eight minutes. He came for a deep cross, got nowhere near the ball, and David Burton-Jones smashed home superbly on the volley from the edge of the area. Action from Peterborough Sports' 2-1 win over Deeping Rangers (claret) in the final of the Hinchingbrooke Cup at Yaxley FC. Photo: David Lowndes. Sports were the superior side for most of the first-half, although Scott Mooney should have given Deeping the lead in the final seconds, but his sidefoot shot from Dan Flack’s cross sailed over the bar. That chance was a rarity though and Sports manager Jimmy Dean would have been concerned his side reached the break only on level terms. Deeping ‘keeper Richard Stainsby saved well from Avelino Vieira from distance and from much closer range after Sports’ top scorer had broken through. Stainsby’s save probably saved the assistant referee from a tongue-lashing as Vieira looked well offside. Mark Jones rattled the crossbar with a thumping header from a corner, but Sports couldn’t find the breakthrough they deserved. Peterborough Sports' top scorer Avelino Vieira on the ball against Deeping Rangers. Photo: David Lowndes. Sports dominated possession for most of the second half without creating as many chances. Deeeping threatened on the break, but spurned their best opportunity when Scott Coupland, Burton-Jones and Dan Schiavi chose to pass rather the shoot, all in the same move. Sports have now completed a league and cup double. The Hinchingbrooke Cup was one of four trophies the city side won last season. Deeping Rangers: Richard Stainsby, Dan Flack, Tom Smith (sub Tom Waumsley, 83 mins), David Burton-Jones, Luke Hunnings, Johnny Clay, Henry Dunn (sub Jason Kilbride, 87 mins), Charlie Coulson, Scott Mooney, Scott Coupland, Dan Schiavi. Unused substitutes: Will Bird, Jack Marsden, Danny Bircham. Peterborough Sports: Lewis Moat, Dan Banister, David Cobb, Richard Jones, Josh Saunders, Lewis Webb (sub Olly Medwynter, 81 mins), Jordan MacLeod, Dan Lawlor, Avelino Vieira (sub Stuart Eason, 81 mins), Mark Jones, Josh Moreman (sub Dan Bucciero, 71 mins). Unused substitutes: Ollie Luto. Goals: Sports - MacLeod (1 min), M. Jones (82 mins). Deeping - Burton-Jones (8 mins).